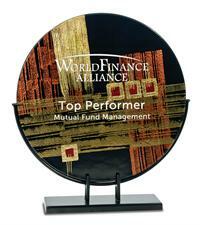 This award features a multi-colored round glass piece highlighted by beautiful gold accents. The award is mounted on a black metal stand. Colors and exact patterns will vary on each artglass piece.